Cowlitz County is located on the Columbia River, adjacent to the Portland metropolitan area. The county has two active ports, a highly productive wood products industry, two paper mills, a diverse manufacturing base and good rail and interstate highway linkages. What became Cowlitz County was first the home of the Cowlitz and Chinook tribes. The first white settlers came in 1825, and a farm was established by representatives of the Hudson’s Bay Company. The Indians who had survived smallpox were forcibly removed in 1855 to reservations in other parts of the state. The Cowlitz has since been recognized as a tribe by the federal government. White settlers continued moving in, but the area really took off in the 1920s. R.A. Long built the world’s largest sawmill. Weyerhaeuser built another sawmill, and the Longview Fibre paper mill opened as well. The city of Longview was developed as a planned community to support timber workers. The Depression slowed things down, but World War II brought an economic boom, including the construction of the Reynolds aluminum smelter. Much has changed in the intervening years. In the late 1970s, there were 6,400 timber jobs in the county, and a third of all jobs were in manufacturing. The county’s per capita income was close to the state average and above the national average. Since then, timber and manufacturing employment has declined, and wages and income have not kept up with the rest of the nation. The county has had some success with diversification, but it has been a case of two steps forward, one step back. During the Great Recession, Cowlitz lost 7 percent of its nonfarm employment, more than the state or nation. Its unemployment rate hit 15 percent (not seasonally adjusted) at one point, before easing downward at the end of 2010. By fits and starts, employment growth turned positive in 2010, helped by construction projects on new investments: a new grain terminal, a new steel pipe plant and two new Walmarts. However, employment retrenched in 2011, stagnated in 2012, before finally taking off in mid-2013 and accelerating in 2017. Employment as of December 2018 was 800 jobs, 2 percent above the pre-recession peak, with a year-over-year growth rate of 1.8 percent. In 2018, one-sixth of Cowlitz County’s employment base was in manufacturing, including two paper mills, several sawmills, a large chicken processor, as well as numerous smaller producers in machinery, fabricated metals, chemicals and other segments. The county has excellent transportation connections, including two active ports, rail connections and Interstate 5. In the short term, as state and national economic growth moderates, it’s likely the Cowlitz employment will continue to grow at around 1 percent per year. There are two large projects going through environmental review. Where one or both of those obtain approval, there could be a short-term surge in construction employment in the county with a smaller gain in long-term employment. Over the past two decades, Cowlitz County’s unemployment rate has run about two percentage points higher than the national average during good times, and three or four points higher during recessions. The average annual rate in the county topped 13 percent in 2009, before easing down almost a point a year through 2017, when the annual rate was 6.1 percent. Preliminary measures of unemployment dropped further in 2018 to 5.9 percent, the lowest rate on record going back to 1980. The county’s labor force participation rate in 2017 was 56.8 percent, with no statistically significant change over the last nine years. The rate was substantially lower than the national mark of 63.1 percent. The rate for women (51.1 percent) was much lower than that for men (62.5 percent), and both were five to seven percentage points below the comparable national figures. A recap of the last two decades: Cowlitz County was hit harder by the 2001 recession than the state, in part due to the closure of the former Reynolds aluminum smelter. Expansion resumed in 2004 but tapered off beginning in 2006. The county led the nation going into a recession in mid-2007. Recovery really didn’t start until halfway through 2013. Employment growth has averaged 1.8 percent over the past five years, with 2014 being a big year and subsequent years somewhat slower. 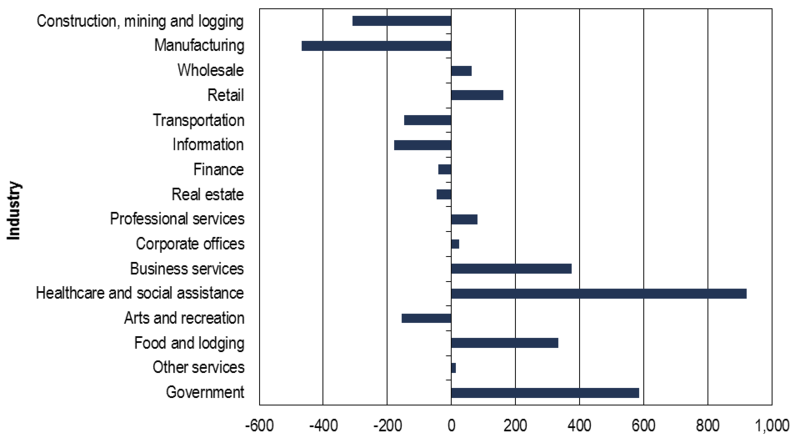 Construction, mining and logging employed 3,300 in 2018, roughly 8 percent of total county nonfarm employment. About 500 of those jobs were in logging. Employment grew by 100 jobs over 2017, and by 400 jobs since 2013. Much of the country’s construction employment has been focused on industrial projects. Historically, the county averaged about 500 housing permits a year. The bubble years drove that number up to 700 units in 2006. The market for new homes bottomed out in 2011 (113 permits), with 2016 being the first decent year of late with 308 units permitted, and 484 units in 2017 looking almost normal. Multifamily units remain in short supply. In 2018, manufacturing employed 6,500, up 100 jobs from 2017 and 200 jobs from 2013. Paper product employment has declined slightly from 2,200 jobs to 2,100 jobs. Gains came primarily in “other nondurables,” which includes a number of industries such as chemicals and plastics. Trade, transportation and utilities increased by 700 jobs from 2013 to 2018, but all of that growth came in 2013 to 2015. There has been no change in employment overall in the last three years. Wholesale trade rose by 100 to 1,500 jobs in 2014, and has held steady since then. Similarly, transportation and utilities added 100 jobs in 2014 and has averaged 1,600 jobs since then. Retail trade expanded from 4,400 jobs to 4,800 from 2013 to 2016 and has stayed put since then. There has been a slight drop in general merchandise stores (Macys closed during this period), while other retail segments added 500 jobs. While retail employment hasn’t increased in the recent past, taxable retail sales were up 6 percent after adjustment for inflation in 2017 and were on track for a 5 percent increase in 2018, based on results from the first three quarters of the year. 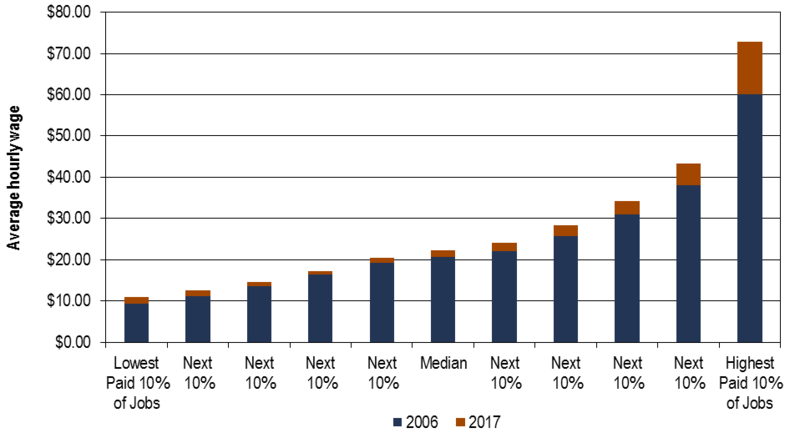 The financial services sector employed 1,500 in 2018, identical to 2017, and a small increase over 2013. Roughly, two-thirds of the total was in finance and insurance, the remainder was in real estate, rental and leasing. The county’s professional and business services sector grew at a 2 percent clip from 2013 to 2018, adding 200 jobs to reach an employment level of 2,200. Professional services, corporate headquarters and business services all added jobs proportionately. Education and health services add 500 jobs from 2013 to 2018, including 200 in 2018. This sector employed 6,500, one out of every six jobs in the county. Leisure and hospitality employed 3,700 in 2018, the same as the two previous years. Hotel/motel sales, which had been climbing steadily since 2013, took a big jump in 2018 from $5 million to almost $7 million. Restaurant sales were up about 2 percent over the year. Government agencies averaged 6,600 workers in 2018, an increase of 200 jobs over 2017. Federal and state government job levels were unchanged – most of the gain was at K-12 schools. Government’s proportion of total jobs in the county has consistently been around 16 percent for the past two decades. In 2017, 12 percent of the jobs in Cowlitz County were held by workers under the age of 25, while 24 percent of jobs were held by those aged 55 and over. The rest of the jobs were split between those age 25 to 34 (20 percent), 35 to 44 (22 percent), and 45 to 54 (22 percent). The county’s age profile was somewhat older than the state’s. Jobs were almost evenly divided between men (52 percent) and women (48 percent). There were substantial differences in gender dominance by industry. Male-dominated industries included construction (86 percent), manufacturing (78 percent), wholesale trade (74 percent), transportation (80 percent) and business services (68 percent). Female-dominated industries included healthcare and social assistance (82 percent), finance and insurance (80 percent) and educational services (public and private combined, 73 percent). The median hourly wage for jobs in Cowlitz County in 2017 was $22.23, a very solid inflation-adjusted increase of 3.4 percent over the 2016 median. The bottom 10 percent of jobs paid 10.5 percent more than in 2016, due to the jump in the minimum wage and the tightening labor market. Average wages actually declined on the upper end. In 2017, average annual wage was $47,677, 10th highest among counties in the state, but well below the state ($62,077) and national ($55,375) averages. The average has risen relatively slow but steadily over the past three decades. The chart above shows the average wage for the lowest 10 percent of jobs all the way up to the highest 10 percent of jobs, and how those averages compared in 2006 and 2017. Wages increased the most on the upper end 20 percent – and on the lower end – 17 percent. Gains were smaller in the middle of the wage spectrum (5 to 8 percent). Thus, wage inequality increased, and likely would have been worse without the increase in the minimum wage. Not surprisingly, household income declined sharply in the recession. Household income estimates from the American Community Survey during this period are not very reliable, with significant sample error contributing to major swings that don’t make sense. The overall trend – the estimate for 2017 median household income, at $49,456 (18 percent below the U.S. median), was no change from 2005. Median family income, which also had a few aberrant years, increased by 10 percent from 2005 to 2016’s $64,239 – still about 10 percent below the U.S. median. 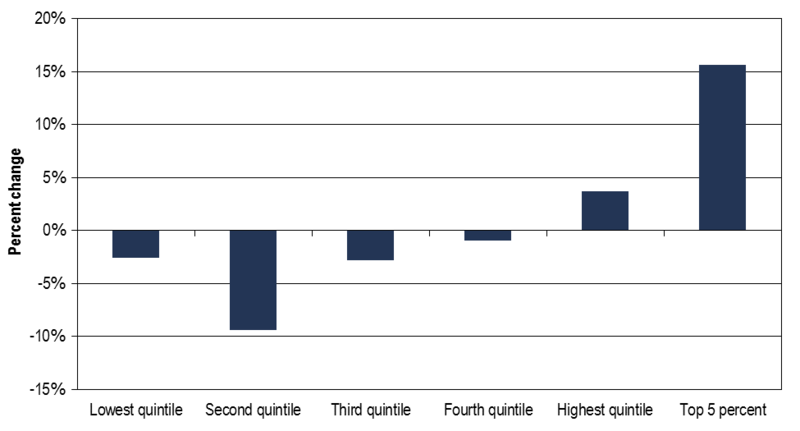 The distribution of income worsened noticeably, as shown in the following chart. The average income for the top 20 percent of households increased by 13 percent, and the top 5 percent of households by 24 percent. In contrast, the bottom 20 percent of households dropped by 17 percent. While this decline may be due to an outlier in 2016, the overall trend over the decade was flat for the lowest income households, so in any event, income inequality had grown. Poverty remained high at 16.8 percent in 2016. Household and family income from the Census Bureau generally defines income as money received from work or investments. Personal income goes one step further by including transfer payments such as Social Security and Veterans Benefits. Investment income is also defined more broadly to include income imputed from pension funds and from owning a home. Per capita personal income equals total personal income divided by the resident population. In 2017, Cowlitz County per capita personal income was $42,888, a 1.1 percent increase, less than the state or nation. Earned income (1.5 percent) and investment income (1.6 percent) grew faster on a per capita basis, while transfer payments were little changed. Transfer payments to residents of Cowlitz totaled $1.2 billion in 2017, an average of $11,466 per resident. That was substantially higher than the $8,779 per capita figure nationally. Much of the difference has to do with the county’s older population – Social Security and Medicare payments were well above the state and nation. Poverty also played a role: Medicaid, income maintenance benefits (which includes Temporary Assistance to Needy Families, more popularly known as welfare) and the Supplemental Nutrition Assistance Program (a.k.a. food stamps) were all above average, as were disability payments and unemployment insurance benefits. Finally, Veterans’ benefits also outpaced the nation. According to state estimates, Cowlitz County’s population reached 107,310 in 2018. The 1.3 percent increase over the year was the fastest since 2007. The county has grown slower than both the state and the nation over the past decade. Longview was the largest city in the county, at 37,710, with adjacent Kelso the next biggest at 12,080. When compared with the state and nation, Cowlitz County had a slightly smaller proportion of children (aged 0-19), fewer younger adults (20-39), about the same middle-aged adults (40-59) and older residents. The county was much less diverse in terms of race and ethnicity than the state. In 2017, 84 percent of Cowlitz’s population was white non-Hispanic or Latino compared with 69 percent at the state level. The county’s Hispanic and Latino population has doubled since the 2000 Census, and makes up 9 percent of the population, versus 13 percent at the state level. Females made up 50.5 percent of the Cowlitz County population, compared to 50.0 percent statewide. Compared with the state and nation, Cowlitz County’s adults 25 years and older were more likely to have only a high school diploma or some college education, vs. attaining a bachelor’s degree or higher. In 2017, 17 percent of Cowlitz adults had a bachelor’s or advanced degree, as opposed to 32 percent nationally and 35 percent statewide. The difference was due in large part to the occupational structure of the county, which has substantially fewer jobs that require a four-year degree or higher.